1,000 HIGH QUALITY BULK RAZORS - Molten forged stainless steel two blade razors. This allows our razors to be very sharp and we promise you will be surprised at how well they compare to high-end brand name razors. GREAT FOR SHAVING THE FACE. Tropical Aloe Vera lubrication strip. Our razors allow for an extremely smooth shave. You get what you pay for with bulk razors. SOLID DESIGN - Handle so comfortable you will not believe it. We use an unbeatable quality rubber grip that does not slip and slide out of your hand when wet. LONGEVITY - Shave for over a week with one razor! Stop paying for razor clubs and high-end brand name blades when you can use one box for an entire year. CONVENIENT PACKAGING - Packaged in sets of 5 razors. Excellent for spas, laser hair removal, tattoo shops, barber shops, hotels, etc. 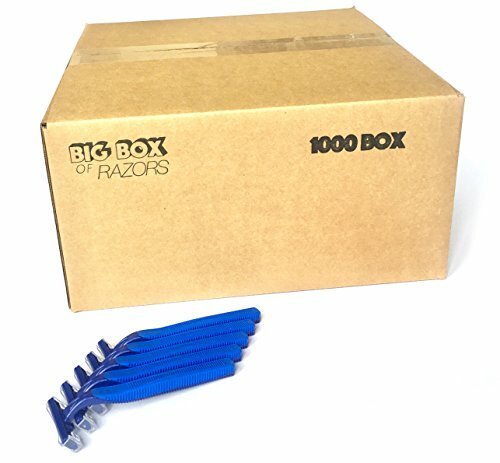 If you have any questions about this product by Big Box of Razors, contact us by completing and submitting the form below. If you are looking for a specif part number, please include it with your message.